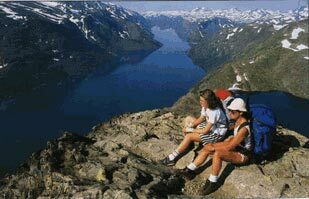 from the pristine snowy mountains, glaciers, and fjords of Norway! 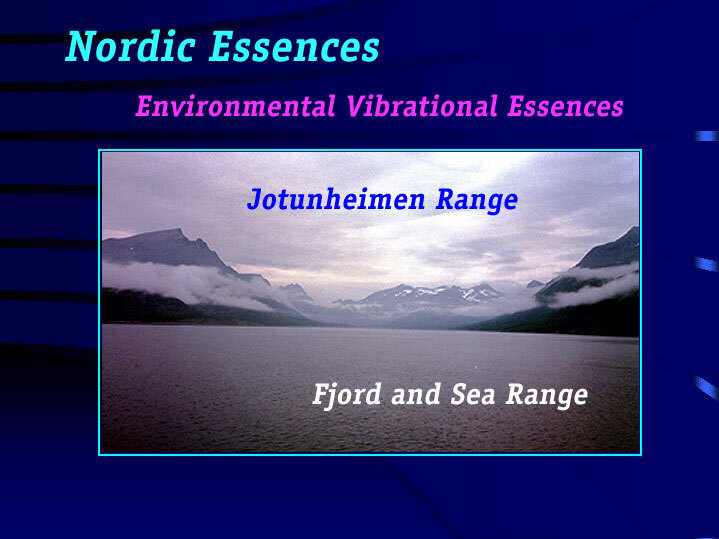 Welcome to the new online home of NORDIC ESSENCES, the environmental essences which help to bring the vibrational qualities of Norway's Jotunheimen mountains, streams, lakes, trees and glaciers out to the world, to assist us on our path when there is resonance. Our website is growing organically! You are invited to browse around, look at some beautiful photos, and see what may be new since your last visit....you may want to send an email if you have comments, questions, or other related information to share, or if you would like to request essences or a consultation. These are the first Environmental Essences brought back from the region of the highest mountains in northern Europe, in the "Home of the Giants," Jotunheimen, Norway. They may be used by mouth, in a bath, or by misting with a spray bottle. 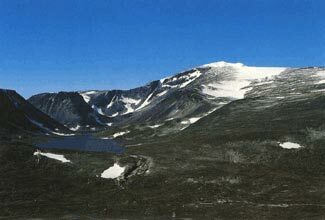 In the spring of 1999, following guidance received at a flower essence conference in England, Randall Barolet returned to the mountain wilderness of Jotunheimen, Norway, trekking from Gjende to Galdhopiggen, and onto the Svellnosbreen Glacier to receive the vibrational essences from the first seven locations. These essences assist us in our life and healing by carrying and transmitting to us their various qualities of vibrational tuning, which allows us to activate our awareness, compassion and self-healing ability. Here are some photos of locations where the Nordic Essences Environmental Essences were received in 1999. High above Gjende Lake, looking westward into the home of the giants, we climb up and onto the threshold along Besseggen, and thus into the Overview. At this point, some may choose to dwell on the threshold, perhaps to encounter some hidden fears in order to break through to acceptance, and find greater peace within before continuing on their path. Others may simply enjoy the view. 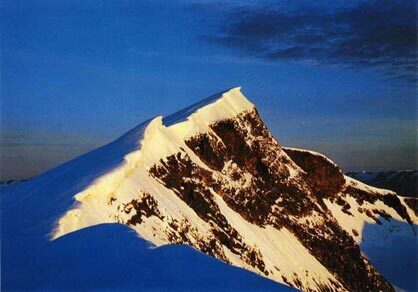 Glittertind in the foreground, with Galdh�piggen and friends in the background, these are the highest peaks in Norway and Northern Europe. These massive paramagnetic mineral pyramids are giant transducers, grounding energy and broadcasting very beautiful energy. The large buildings of the Glitterheim Hytta are just some small dots at the bottom right in this photo of the massive glacial landscape! "Here, every stream is an essence!" This helped clarify my thinking about how the environmental essences might be received. On the way to the base of Glittertind, a beautiful essence for the Heart Chakra was received from a pure mountain lake in a heart-shaped mountain pass, called 'Tj�rnholet'. 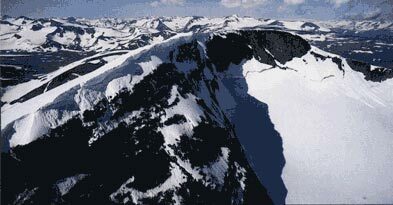 This is the top of Glittertind, where I arrived on the full moon just before the galactic crossing, in August, 1999. It was a cloudless day, and one was able to "walk" right to the top without special equipment. Here was truly the 'Crystal in the Crown.' The crystals from the tip of this Nordic "receiver/broadcasting station" were received as the essence for supporting engrailed pineal activities, the transformer for the UnitySelf of AllOneness. 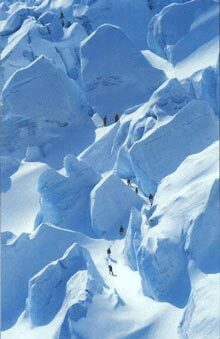 Tied together with rope we strapped on the ice spikes and began the climb over, and INTO, the glacier! Our guide took us inside of the ice passageways of Svellnosbreen for an intimate experience of acceptance and surrender in the blue ice! Underneath this inestimably heavy mountain of ice one begins to understand the meaning of "patience" and "acceptance," while at its base one can experience the "Melting, Celebration and Release". A truly surprising and wonderful experience of the essence of frozen (and melting) water! Note: orders are currently only shipping from England, payable by check to USA and shipping costs by international money order to England. We apologize for this inconvenience. 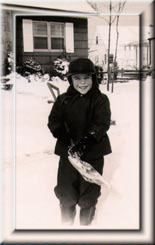 I remember that I really liked shoveling the snow around our house. We used to get tons of snow. That was before there was global warming. Copyright 1999-2008, Randall Barolet. All rights reserved. visitors since December 20, 1999. Check out the link below for a starship ride! 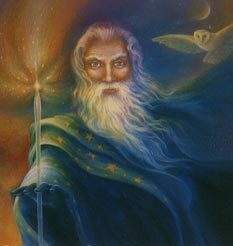 ATON, ANANDA/EMMANUEL This link will transport you directly to the gateway of the combined ATON, ANANDA/EMMANUEL, and ODIN site, where you can explore hyperspatially to your Heart's content.